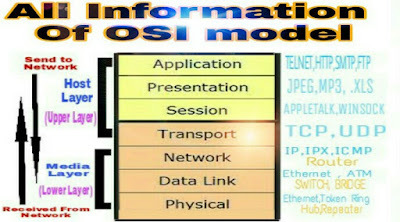 The OSI model is standard develop by the ISO International standard organisation to describe the follow of data on a computer network this model is called OSI open system interconnection reference model because it deal with connecting open system. 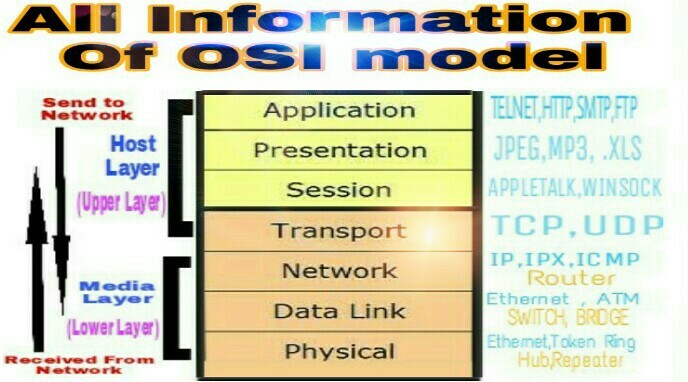 Open systems are those which are open for communication with other system this model allow all network element to operate together no matter who create the protocol and what computer when that supports them the OSI model is a seven layer structure that specifies the requirement for communication between two computers. Host Layer provides accurate dated every between computer. Media Layer provide the control of physical delivery of message of the layer. 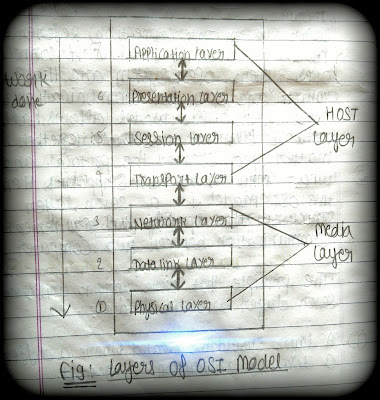 It is the top most layer of OSI model.The softwares which interact one human to each other is called application layer. It provide service that directly support user applications such as database access email and file transfer its allow application to communication with application on other computers as through were on the same computer the relationship of the application layer to the user layer. Ex= Telnet, SMTP (simple mail transfer protocol) HTTP (hypertext transfer protocol) FTP (file transfer protocol) etc. (b) Network Abstraction: It has the availability the print on a network. (c) Email Service: By using the application layer we can send the electronic mail email. The Presentation Layer is responsible for data translation compression and encryption and what is the format of data and the presentation layer is privately concerned with translation interpreting and converting the data from various format. so, the basic purpose of presentation layer is to present the entity in a way that person the mail while solving the syntax. (a) It enable receiving devices to understand the information from the source. (b) It convert data from active format to a common format. (a) By reducing the volume of data transfer can take this in less time. 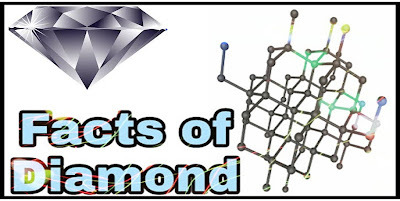 (b) Packet are examine as such thing as space is index remove. (c) The destination device return the data to its original format before passing to the application layer. (a) It allow data to be converted to a for.those you wish to see it. (b) In order for description to occur at the designation device a key is required. In simple words about of session layer create and manage the sessions by a port number is called session layer. 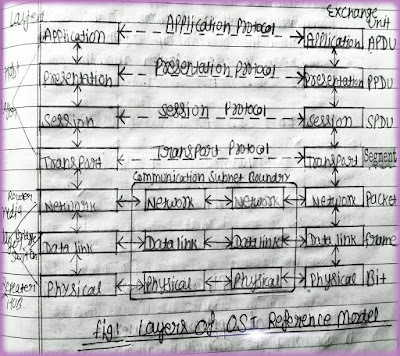 The session layer is responsible for establishing maintaining and terminating connection called session layer a session layer is an exchange of message between computer managing the session involved synchronization and user task dialogue control. The session layer provides various services including broking the number of bytes that each end of the session layer has acknowledge protocol. Ex= FFS, SQL, PCB, ZIP etc. (a) Virtual connection between application entities. (b) Acknowledgement of data received during session. (c) Synchronization of data follow. (e) Creation of dialogue unit. (f) Re-transmission of data if it is not received by a device. Transport layer is end to end delivery of data from source to designation.Transport layer is the biggest layer in OSI Model. 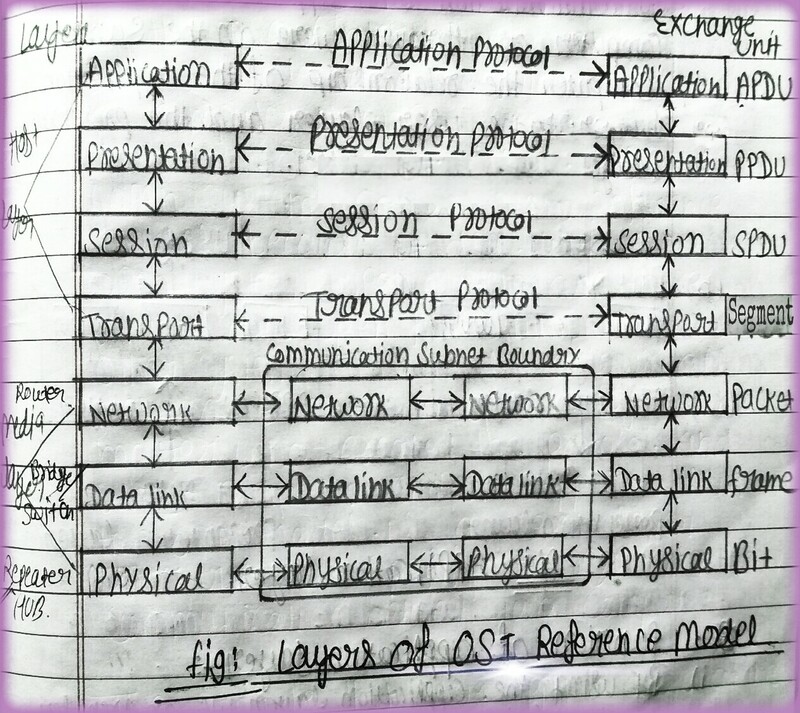 The transport layer is responsible for flow control and ensure message are delivered error free on the sending side message are package for efficient transmission and the transport layer and error assigned a tracking number so they can be reassembled in proper order on the receiving side the packets are reassembled check for error and acknowledge the transport layer perform error handling in ensure all data is received in a proper sequence and without error if there are error in the data is transmitted common protocol that operates the transport layer. The transport layer of the OSI offers end to end communication between end devices those network depending on the application the transport layer either offered collection avoided, connection less but effort communication. (b) Client-side entity identification segmentation of data for network transport. (c) Establishment and maintenance of both end of virtual circuit. (d) Realignment of segmented data in the connect order in the receiving order. (e) Multiplexing or sharing of multiple session over a single physical link. (a) Guaranteed data of delivery with acknowledgement. (a) Non-guaranteed data of delivery without acknowledgement. Network layer control the operation of the (subnet) a key design issued is determined how packets are routed from source to destination when a packet has to travel from one network to another to get it destination many problem can arise. The addressing used by the second network maybe different from the first one.The second one may not accept the packet at all because it's too large. The protocol may different and so on it is up to the network layer to overcome all this problem to all network layer is primarily concerned about addressing and routing. Routes are determined based on packets address and packets condition traffic control measures are also implemented at the network layer. Ex=IP, IPX, ARP, SMTP, IGMP etc. It decide how the signal will be place or taken on the(NIC).It is here that the data frames are broken down into individual bits that can be translated into electronic signal and set over the network. On the different type bits are assembled into frames for processing by upper layer if the acknowledgement is expected as not receiving the frame will be resend corrupt data is also identified at the data link layer. It is very complex. (a) MAC Sublayer (Media Access Control). (b) LLC Sublayer (Logical Link Layer). (a)MAC= This sublayer provide network layer. It is a 6 bit. (b)LLC= It is concerned with sending and receiving packets and error checking. 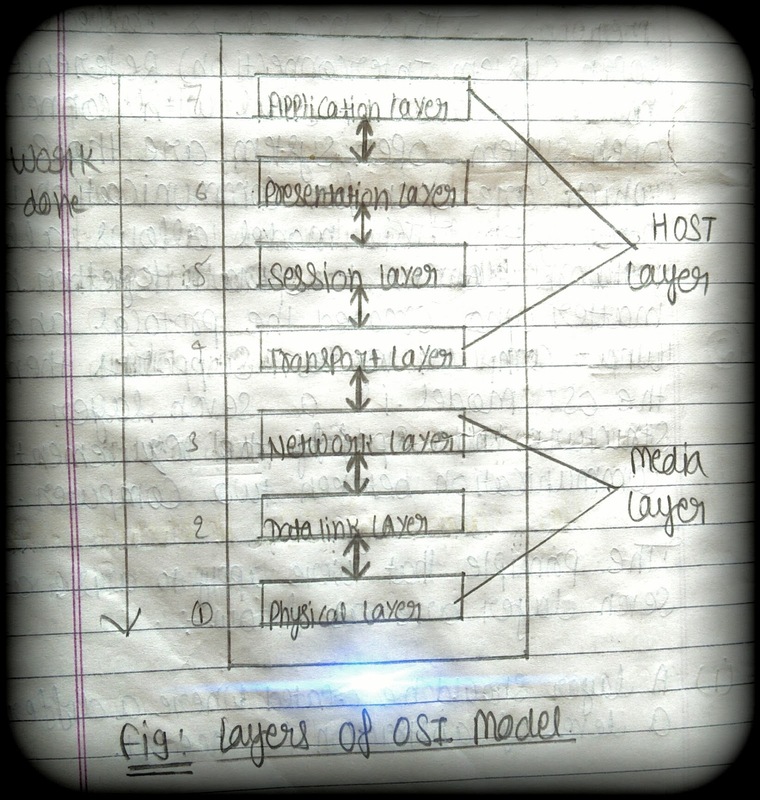 This is the lowest layer in the OSI model it helps in the transmission of data between two machines that are communicate through a physical. It can be Optical Fibre media. Ex= Simplex, Half duplex, Full duplex, Ethernet, RJ45 etc.